The Drake Escape... and Cupcake Raid. Drake made household history yesterday. He broke out of his jail-like crib for the first time. Ever. CRAZY, that it's taken my buff little man this long I know. WEIRD, that he actually loves sleeping in his crib. ...and LUCKY that he does... or did. I think he had extra motivation for escaping since his cousins Madison and Seattle had slept in Haven's room and were up early and apparently having a blast without him. He's always our early riser... even though Haven's usually out long past the time her preschool's start time at 9. They are total opposites it's hilarious. 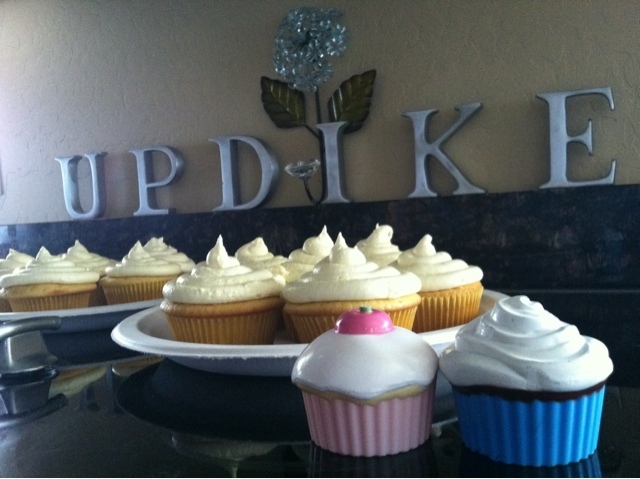 Well my masculine little man is obsessed with one of the most feminine desserts of all time: cupcakes. Random, right? He is always carrying these plastic ones around on a plate and pretending to feed us. He's an aspiring bakery server apparently. So this morning I awoke not to him screaming "MOMMA...OUT!" from upstairs like normal. Oh no... I woke up to something sweeter... (I had hoped he had forgotten in the wee hours, as I obviously had, that he was able to escape) as I opened my eyes to my little server bringing me breakfast in bed, though not offering his usual plastic pastries but two actual cupcakes that Haven, Olivia and I made last night. We had such a fun night that began over our friend's the Quintana's... it entailed very delicious food... slow cooked smoked chicken and pulled pork. Yeah... and everything else amazing. We then went to the Pioneer Classic Charity Event at Wigwam Country Club and had even more deliciousness. Needless to say we're very full... and had a blast. We're so lucky to have enjoyed such great company with Adrienne & Phil, Jacy & John, and UDL buddies: Mark and Chris, Alison & Josh, Bill & McKenzie. I even learned how to play BlackJack at the Pioneer Classic... and NO gambling or money was involved. :) -WINNING!!! !- It was just for fun, and I even became friends with the cute little dealer lady named Lin. She was totally telling me what to do... as Mark and Greg were explaining the odds and reasoning behind it all. It's definitely a good thing I don't gamble... but it's a shame that Greg doesn't. J/K He would have made it rain hunzo's of IMAGINARY moolah. Hahahaaaaa. :) It was a hilariously fun night! Here's Our Big Friday Night Plans. :) I couldn't be happier watching Haven and Drake follow daddy around as he mows the lawn. Love them!